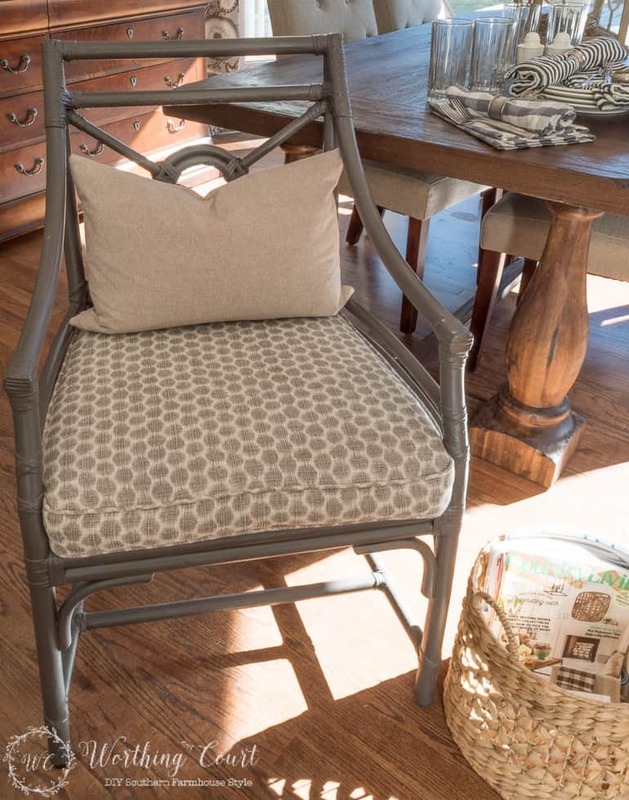 Did you happen to catch the Reveal Of My Breakfast Area Makeover yesterday? As promised, I’m back today to share some of the simple and affordable diy’s that I did in here. Hopefully, you can find some inspiration for your own home. What you don’t see in the before photo is how chipped the paint was. And you don’t see the lovely pale green cushion either. And here is what they look like after receiving a couple of coats of spray paint and after a getting new cushions made by my upholsterer for only $35 each + the cost of the fabric. I painted them with Rustoleum spray paint in Anodized Bronze. For me, it’s the perfect gray with brown undertones, which warms the color right up. I guess that I should have left the throw pillow out so that you could get a better look at the whole chair. I should have done a tutorial on these shelves, but I didn’t. They were so simple I can probably just explain it to you along with a few photos. 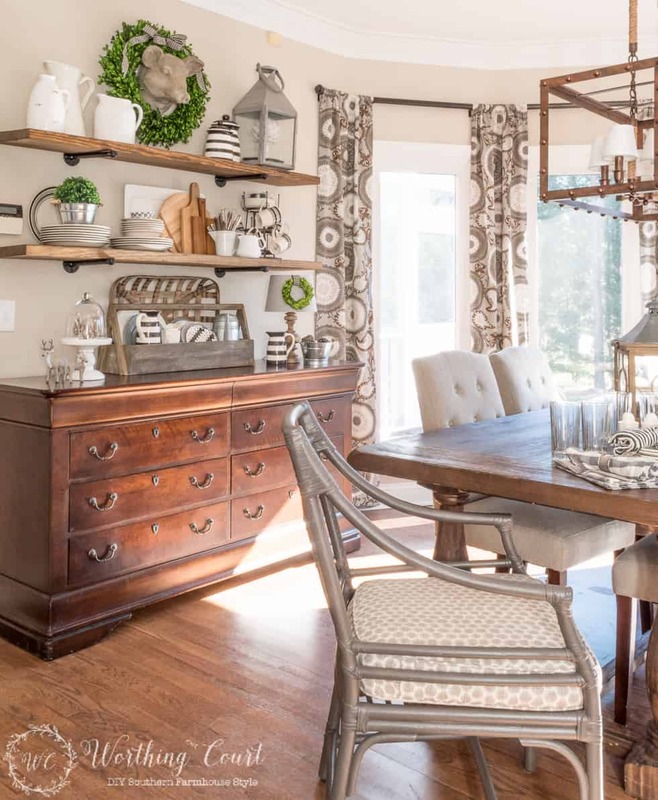 When it came to determining the spacing of the shelves, I knew that I wanted to make sure that I left room to display trays, platters and other larger items. I measured a few of the trays that I thought I might ever use to figure out how much space I should leave. I also was originally planning to put three shelves above the buffet, but then I realized that even though we have 9′ ceilings in this room, that would make the top shelf too high to display anything on. So here’s what I came up with: 1) from the top of the sideboard to the bottom of the first shelf it’s 18″ and 2) from the top of the bottom shelf to the bottom of the top shelf, it’s 15.5″. 2 – 5′ lengths of 2″ thick x 12″ wide pine boards I used thick wood because I love the beefiness of it and it kept me from having to add a brace in the middle of each shelf. #80 or #100 grit sandpaper – A palm sander comes in really handy here and will make the work go much quicker. 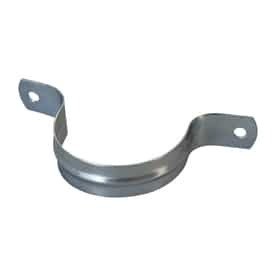 Step 1 – The galvanized parts are what the shelf brackets are made from. I found all of the parts in the plumbing section of a big box home improvement store. They are very greasy, so you need to thoroughly wash all of the parts in warm sudsy water, rinse well and allow to dry completely. Step 2 – To make the brackets, assemble the painted, galvanized parts as shown in this photo and spray with black spray paint. Allow the paint to dry thoroughly and attach the brackets to your desired location on the wall. Make sure that the brackets are level to each other. The floor flanges have four pre-drilled holes for screws in them. I made sure to turn each flange so that two of the holes would be lined up with the stud behind the drywall. I added drywall anchors for the other two screws. Touch up the screw heads with black paint as needed. Step 3 – Give the boards a good sanding on both sides and then use a damp cloth to wipe all of the sawdust away. Apply stain and allow to dry completely. I applied two coats of stain, allowing the stain to dry between coats. It’s up to you whether to add a coat of polyurethane or not. I chose not to because I’m impatient and didn’t want to wait for it to dry. I recommend that you do apply poly though, if there’s a chance you’ll be sitting anything wet on your shelves. Step 4 – Lay the boards on top of the brackets and decorate. And y’all – that is it. The boards are so heavy that I thought they would stay in place on their own without adding anything to hold them in place. If you’re worried about your boards getting bumped or possibly moving, I would add a U-shaped pipe strap (that has been painted black) over the pipe and attached to the bottom of the shelf. I explained all about how I made the large piece of art above the bench in a previous post. You can see what I did and download the free printable HERE. Anyone who has a bay window or a multiple sided window can tell you how expensive the drapery hardware can be. I guess I’m cheap because I just didn’t see any reason to cough up the amount that the hardware for this window would have cost me. BUT, here’s one thing to consider – I knew that my draperies would be for looks only. They wouldn’t be pulled on and the draperies are unlined so they aren’t heavy at all. 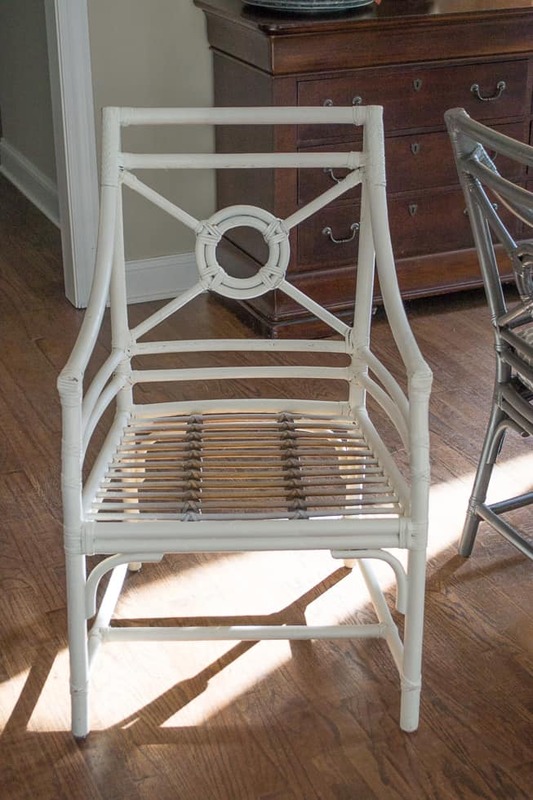 If this was a case where I needed the draperies to be functional, then I would have sprung for the real-deal bay window hardware (brackets, rods and adjustable rod connectors). For those of you who have already asked, they do make special connectors for the drapery rods used in bay windows, which can be adjusted to any angle. Just do a Google search for “bay window drapery rod connector” and you’ll get several options to choose from. So, here’s what I did. To create the drapery rod, I purchased 2″ pvc pipe and cut it to length for each of my windows. Each one of the rods was then painted with Rustoleum’s Oil Rubbed Bronze spray paint. To join the rods, I technically should have cut the ends of the pvc pipe at an angle (where the rods meet in each angled corner), but since I knew that the area would be covered by the draperies, I cheated and simply butted the ends against one another. Here’s a closeup of one of the angles. You can’t even tell that the ends are just butted up together. Next came the question of how to mount the cheater drapery rods to the wall. As you can see, I spray painted L shaped angle iron brackets to match the rods and screwed them to the wall (using drywall anchors as necessary). The rods are resting on top of the brackets with a screw going up through the pvc pipe to hold them in place. I placed a bracket on each side of every angled corner and then touched up the screw heads with paint. You can see that I still need to touch up the paint on the trim since the windows were replaced. 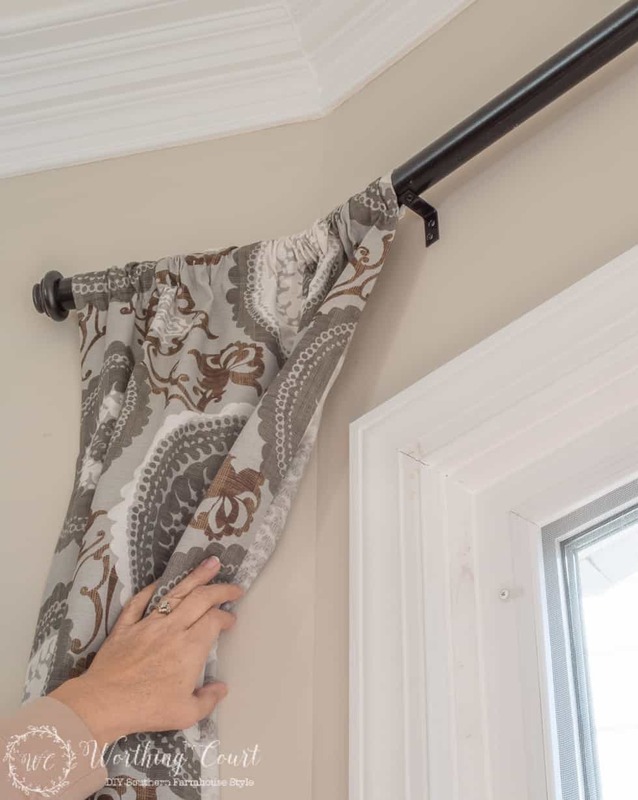 You’ll want to make sure that your drapery rods are absolutely level across all of the windows. Oh, and that finial? It’s just a regular drapery finial that I hot glued to the end of the pvc pipe. Cheater, cheater, pumpkin eater. Now for the drapery panels. I used three of THESE panels from Target because of the colors and fabric pattern. We have 9′ ceilings, so I chose the panels that I wanted in the store, but had to order them online because my local Target doesn’t keep 96″ length panels in stock. I normally prefer my draperies to be lined, but I knew these would be against the wall and not over a window so sunlight shining through wouldn’t wash out the pattern. I also knew that I didn’t want to cover any of the glass in the windows at all, so less bulky panels were a must. 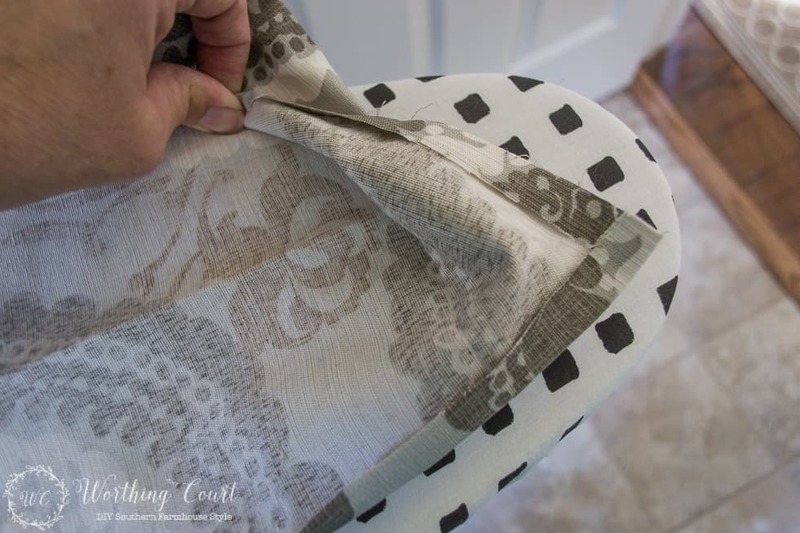 I solved that problem by cutting each of the 54″ wide panels in half and then double folded and pressed the raw edge under and used iron-on seam tape to put a side hem back where the cut edge was. I redid the edge of the rod pocket and bottom hem using the same method. As always, putting together any room is a process. For me it’s never a quick one, but it’s always so worth it in the end! Let me know if you have any questions about these or any other projects and I’ll do my best to answer them. I love your makeover! 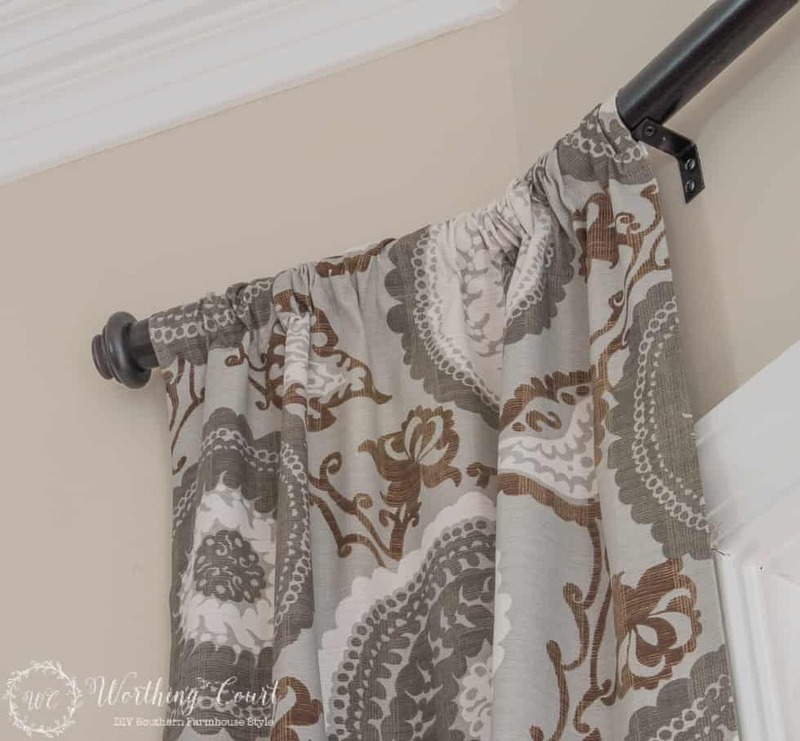 Although I haven’t used PVC pipe for curtain rods, I have used the elbows to connect rods. I spray painted the elbows to match the rods. Your room looks beautiful and that light fixture is definitely an eye-catcher. Hi Debra. So glad you like my breakfast room! I actually bought some pvc elbows for this project, but the angle of them wasn’t right. :/ Since this is a 5 sided window, the corners have a little less of angle than a true bay window does. I was so scared about how that light fixture was going to look when I ordered it, so I’m glad to hear that you like it. The buffet you have is beautiful. Is it one you’ve had or is it new ? Hi Sandra. The buffet is the same one that I purchased at The Salvation Army not too long after we moved into this house. In case you didn’t see the post about it, it’s actually a bedroom dresser that I use to store kitchen and table linens in. You created a beautiful livable room! I love it! Thank you, Nancy! I took advantage of your Christmas sale last week, but I missed you. Hope to see you next time I’m there! 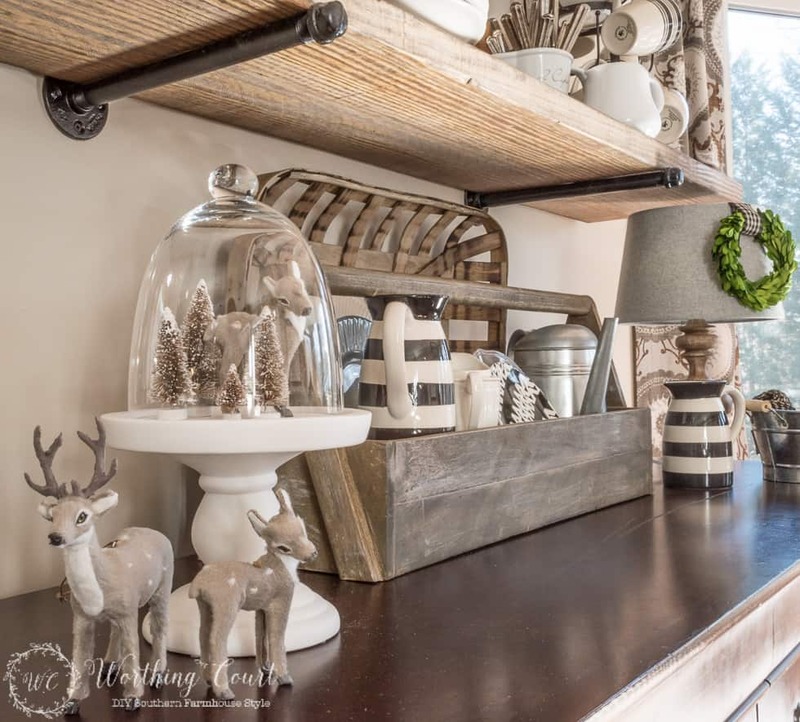 I am in love with your breakfast room Suzy and all of the beautiful details you have added throughout! I have really been enjoying all of the creative projects, decorating ideas and room makeovers you have shared with us in your new home, every room is absolutely stunning! Wishing you a Happy New Year! You’re too sweet, Lauren – thank you so much! I’m hoping that the Raleigh and Greensboro gang can meet up for lunch one day this spring. Happy New Year to you as well! So beautiful! Those shelves! The drapes! And your greenery really pops! Just a wonderful room. Congrats! Thank you, Debra. The greenery makes me think of spring and warmer days ahead! Thank you, Donnamae! Hope you have a great day. Can you please tell me where you purchased the black and white jars on your shelves? Thank you in advance. Seriously, this is one of my favorite homes/spaces ever! I love how comfy cozy it looks and yet so polished. I want to move in….tomorrow! Love love love all your touches and aim to create this look and feel in our home. Aw – thank you so, so much, Patty! where did you get the mounted pig head? The colors are so beautiful, I love how it turned out. You have created such a warm and beautiful space – it’s absolutely lovely! I am going to use your drapery rod idea and also purchasing the Target drapery panels. This post has helped me tremendously with decor decisions that had left me at a standstill. 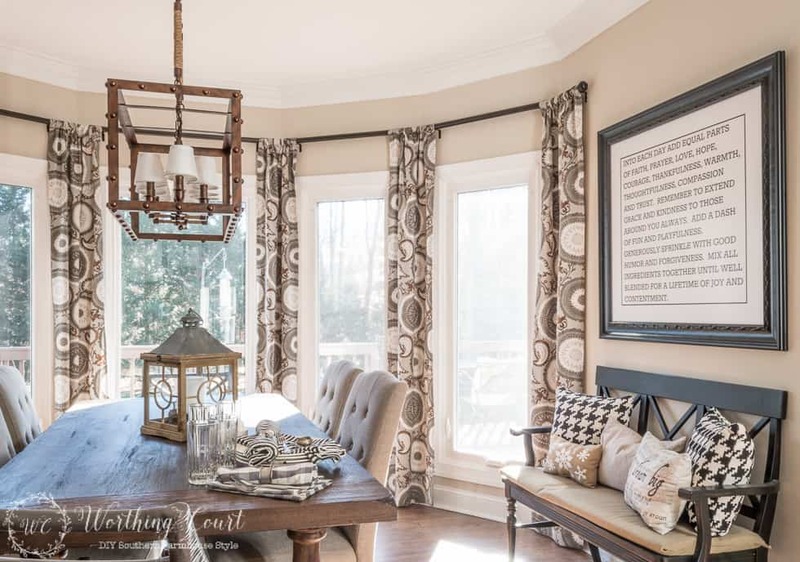 I am also thinking of buying the light fixture – it is fabulous and looks fantastic in the room. Thank you so much, Liz. I’m happy that I was able to inspire you! Have fun decorating! Love those shelves, great job! Thanks so much for sharing on craft schooling sunday, and since I’m pretty sure this is your first time at the party, wonderful to “meet” you! Thank you and nice to meet you too! Hi Suzy. This question is actually from my husband. 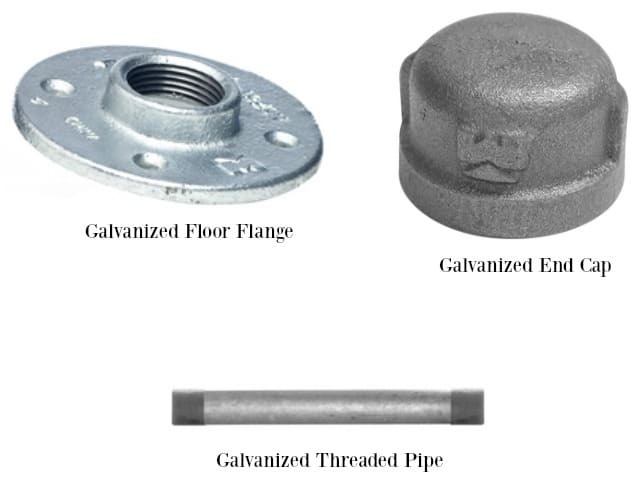 Why did you use galvanized parts rather than iron for your shelf brackets? I love your shelves. I want my him to do two for me like them. Your breakfast area looks very cozy and inviting. I know you enjoy it. Hi Donna. The main reason that I used the plumbing parts is because I like the slightly industrial look of them mixed with the rustic farmhouse’y vibe that’s going on in the room. Plus, all of the ready-made metal brackets that I liked were out of my price range. :/ Glad you like the breakfast area! The shelves are so creative! Thanks for sharing on the #HomeMattersParty . I hope you will join us again next week. This dining room!!!! Ah!!! You did such a lovely job! Wow Suzy! THis looks like it is out of Pottery Barn! Great job on the makeover! How long ago did you purchase the drapes at Target. I tried to find them on their website but can’t seem to see them. Do you know the pattern or item number? Hi Tammy. I purchased them in either September or October. The direct link to them is: http://www.target.com/p/threshold-farrah-medallion-curtain-panel/-/A-14569271#prodSlot=medium_1_53&term=gray+drapery+panel . It looks like they’re only available in stores now. Your dining room looks awesome. Love everything about it. Great job! I love your shelves – I wanted to do something like that in my kitchen, but we are not sure if there are pipes behind the walls. We live in a condo so God forbid we hit a pipe the person downstairs from us would have a flood. But……….good news I found a sweet cupboard on decor steals that I can place on the counter. Can’t wait to decorate it. Hi. I have a question-I love the breakfast shelves makeup over you did, where did you purchase all the black and white striped dishes you used on display? Just love the pop they give to the over all look. Thanks for any information you can share with me. Hi Brenda. The black and white plates, bowls and mugs came from Dollar Tree. The black and white striped canisters were a HomeGoods find and the black and white striped pitchers are from the dollar spot at Target a few months ago. The little small black and white plate in the “toolbox” was another Target find from their clearance section. Hope this helps! 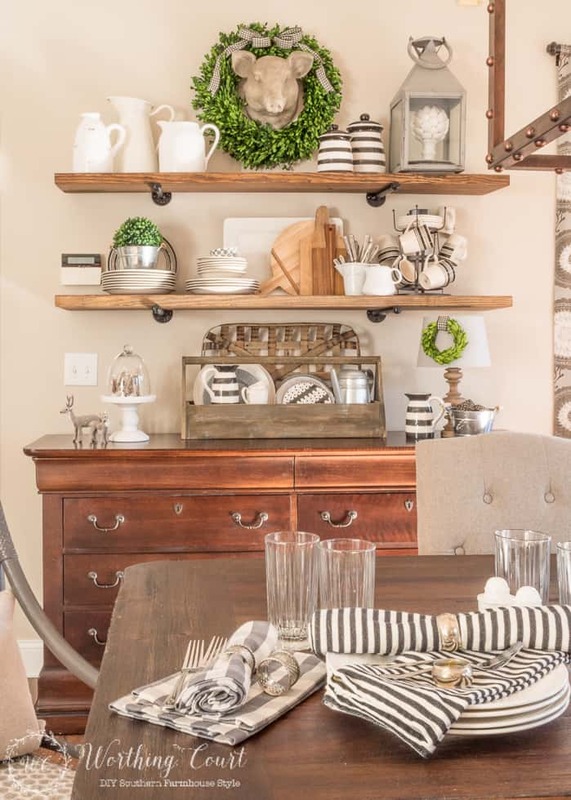 Your shelves in the dining room are just what I have been searching for the farmhouse we built last year. Sometimes the really simple solution is right before my eyes but I need a clue to really look. Thanks for the fix my husband can have done in a day. I will be checking your site often from this day forward. 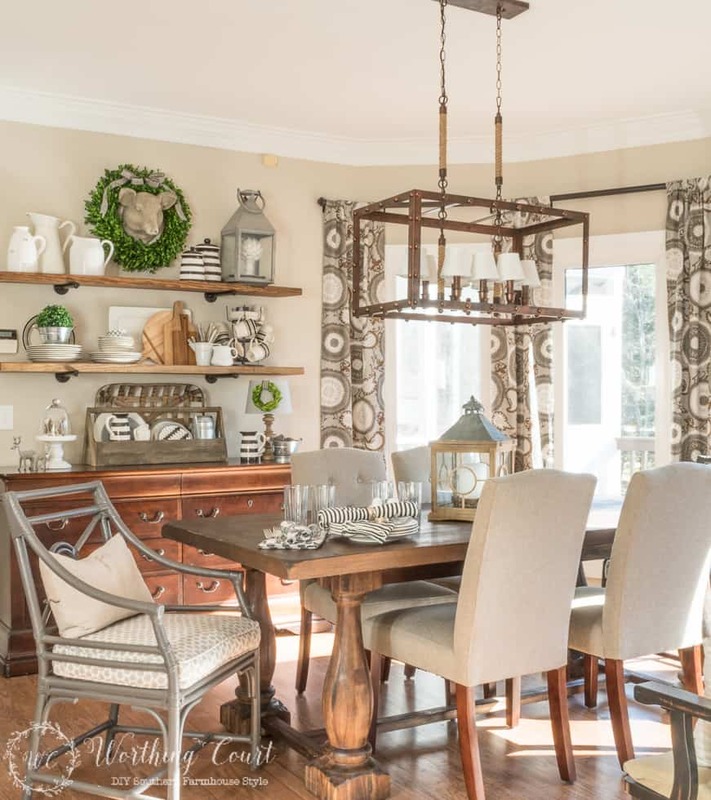 Such a pretty dining space. So much to love: curtains, shelves & industrial brackets, light fixture. Excellent choices! I love your dining room. It’s so pretty. Thanks so much for all of the tutorials. The one I like best is about how you made drapery rods out of PVC pipe. I would never have guessed!! I love the open shelving! It opens up the whole room which all looks amazing by the way! You’ve done a wonderful job! I love your shelves! What a great way to display things you love and use and be able to easily switch the display up to keep the decor current! Hi Sue. From the top of the sideboard to the bottom of the first shelf it’s 18″. From the top of the bottom shelf to the bottom of the top shelf, it’s 15.5″. BTW – are ceilings are 9′ high. Hope this helps! Beautiful. 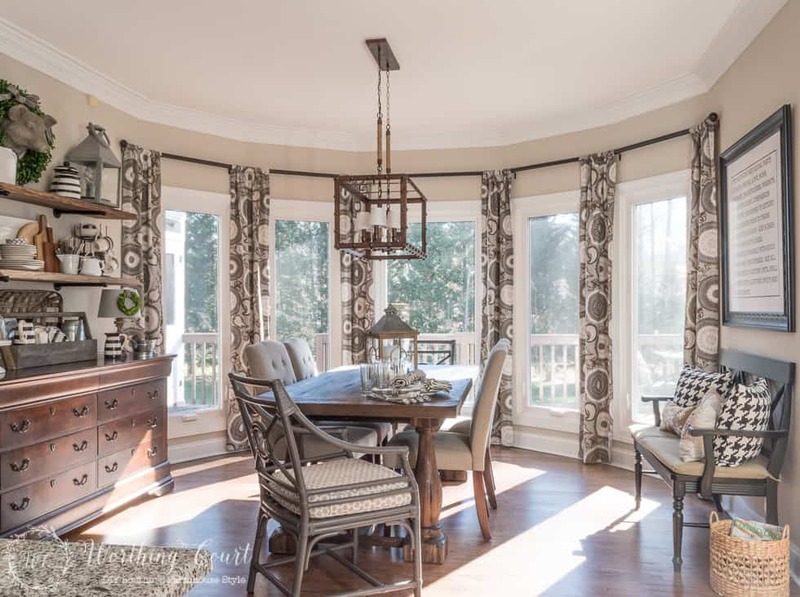 Where did you purchase your breakfast room table? ?